So after our yummy lunch of pho, Vince and I went in search of two independent bakeries that I had planned to visit. Carmen recommended both Jelly Modern Doughnuts and Yann Haute Patisserie to me, but to be honest, I was most excited to visit Jelly! The reason being that everytime I used to visit Calgary, it was mandatory to stop at Krispy Kreme! Their Original Glazed donut is such a treat, and I would always get one dozen to take home, and easily eat 4 or 5 of them all by myself. About two years ago, Krispy Kreme shut down, and the spot for donuts in my stomach has forever been left unsatisfied. 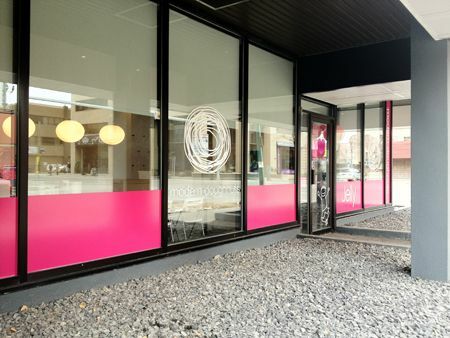 Jelly Modern Doughnuts is located conveniently in downtown Calgary, and to our biggest surprise - across the street from the hotel we were staying at! If it weren't for them closing for the long weekend Monday, I probably would've had a very sweet breakfast. The moment I walked into the bakery, the aroma of delicious, fried dough reached my nose - familiar to the scent of Krispy Kreme, but not as sweet. At the other end of the bakery is a cute little seating area - I could imagine myself enjoying a donut and getting some work done, if only the tables were taller! Enough of the shop, onto the goods.. in which the pictures will speak for themselves. They cater to younger children too! Don't they all just look amazing? 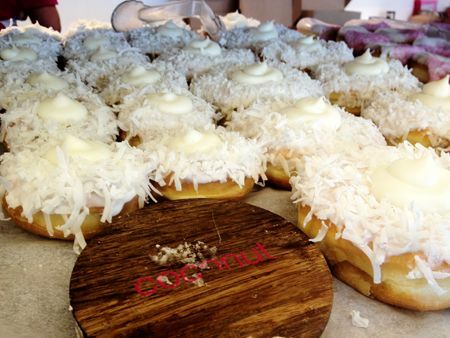 Their donuts (with exception to the cake donuts) are available in snack or regular size - snack is perfect if you're looking to try a variety. The donuts were fresh and not too sweet. I loved the soft dough, which wasn't too airy or dense, giving it the perfect texture. If I had to choose, my favourites would be the maple bacon and s'mores flavour. I really want to try the salted caramel the next time I'm there! Something that I really love about this establishment though, is that they use and support local products, and try to give back to the community as much as they can. Accordingly, everything is made fresh on site each day - they don't even have a freezer on the premises! At the end of each day, any leftover baked goods are given to a local organization. Each month they promote a different charitable organization as well. Although the donuts are quite delicious, I still have to say Krispy Kreme has my heart. Next time I'm in Calgary though, you'll find me here. Love the Food Network? 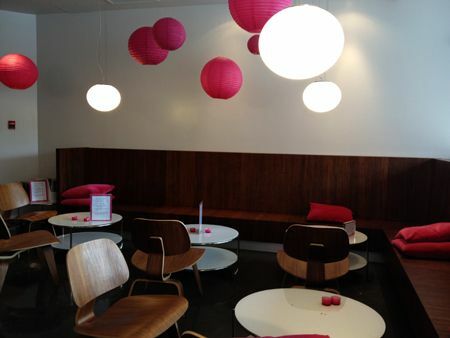 Jelly Modern will be appearing on the show 'You Gotta Eat Here!' on May 18th, 2012. 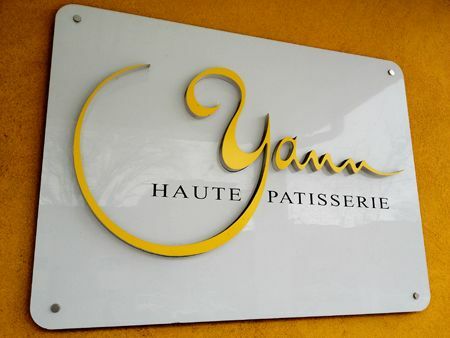 After spending a chunk of our day drooling over donuts, the next stop was at Yann Haute Patisserie. 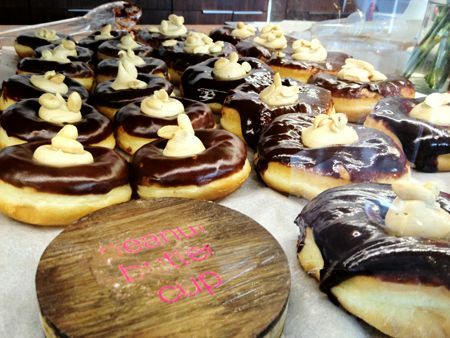 Located about five minutes from Jelly Modern Doughnuts, this bakery was situated inside a bright yellow house. Opening the door to get inside, there was a long line of about 7 people ahead of us. And as we waited, the line moved ahead of us, but also grew behind where we were. Overhearing the conversations, many of the people were loyal patrons, whom told me this bakery consistently produces high quality baked goods. I was extremely excited. The decor on the inside is simple, clean, and elegant. I loved the red & white! 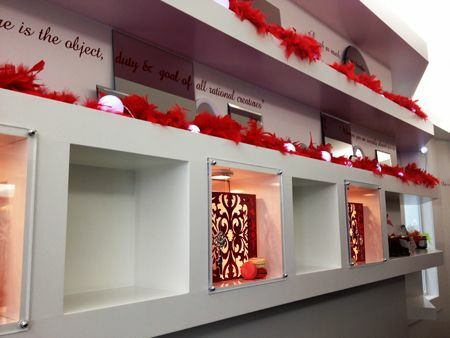 Bold, but classy.. and maybe a little romantic in the spirit of the recent Valentine's Day that passed. The main reason for my visit to Yann's was for their macarons. 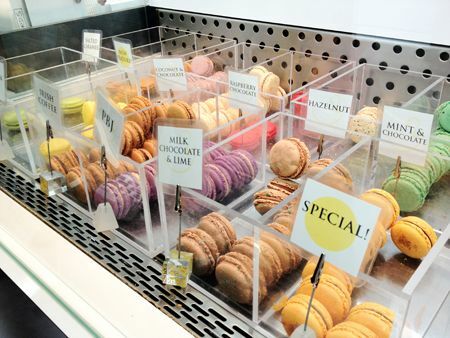 I was expecting macarons with similar flavours and sizes to those at Duchess, but I was blown away by their offerings. 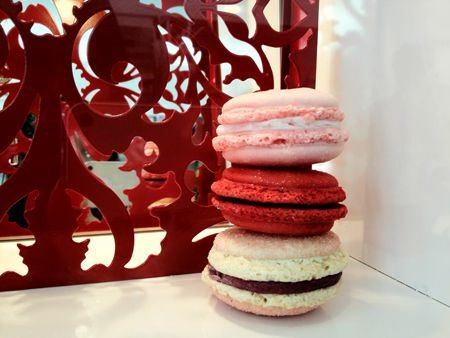 In addition to their unique flavours, the size of the macarons is about triple that of those offered by duchess. We ended up buying one of each flavour, and I must say that my favourites were salted caramel, coconut & chocoate, raspberry & chocolate and pistachio. The shells were soft with a light chew to them - I could eat quite a few without even noticing it. This post is a continuation to my mini trip to Calgary over the weekend. Read part one here if you missed it! the french macaroons look amazing! i cannot see you following me? 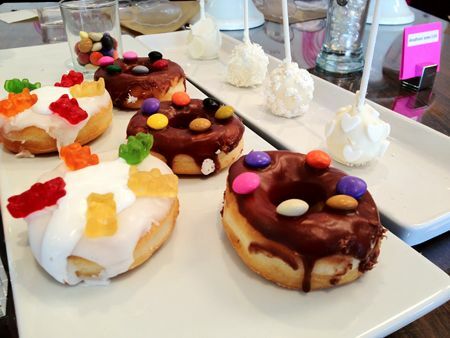 OMG THOSE DONUTS AND MACAROONS LOOK DELISH!! I WANT! 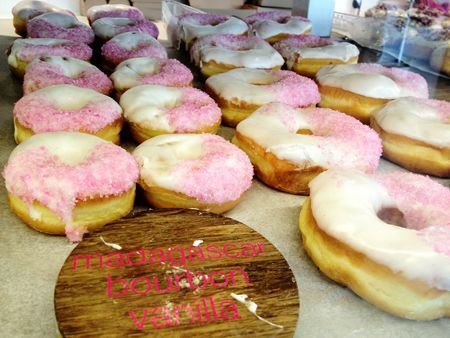 I'm more of a donut person than macaroons. But I'm always fascinated by how pretty macaroons can be. I miss Krispy Kreme dearly. The original glazed is always my favorite. So warm and soft that it melt in your mouth. The donuts you had are amazing. So freshly-made. 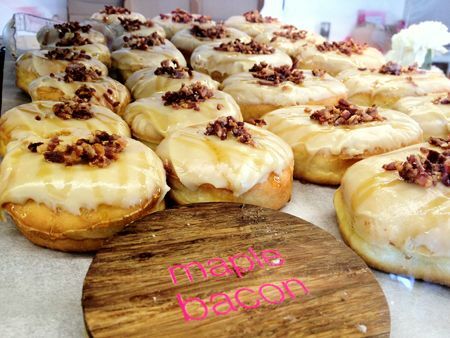 I'm interested in the maple bacon ones. Combination sounds interesting. Did you try those? 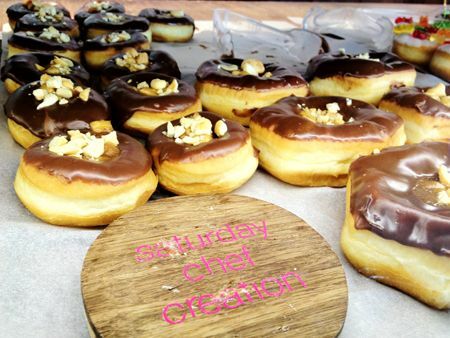 i love macaroons.. but i'm DROOLING over those doughnuts!!! maple bacon (*&@(#*$&@(#*$&@# and smore's!!! OMGGG THEY LOOK SOOOO GOOD!!!! What a wonderful treat for a sweet tooth like me, really craving for some now. Got my eye on those delectable donuts. Andrea, you've just sent my sugar level UP girl! 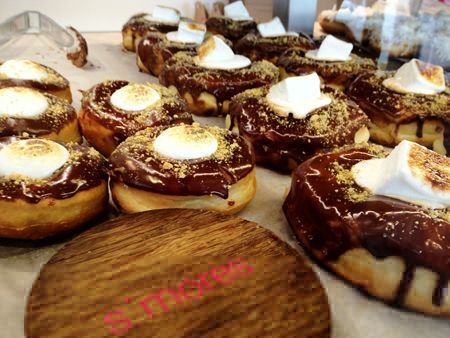 HaHaHa I can't get over those s'more doughnuts! OMG'd! And I'm just like you I can inhale some Krispy Kreme doughnuts. So good, but not good. HaHa Those macarons are gorgeous and I know they tastes delightful. Thanks for sharing your experience. 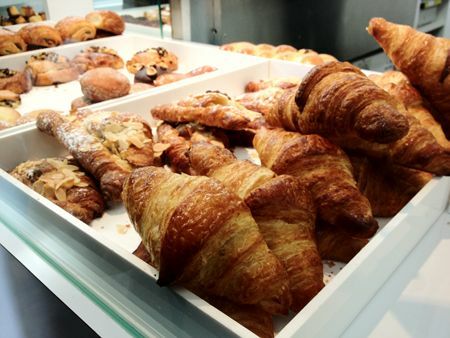 the pastries look soooooo nice! Just found your sweet (literally) blog! good and beautiful!! !amazing blog!! !i'm following you!!! 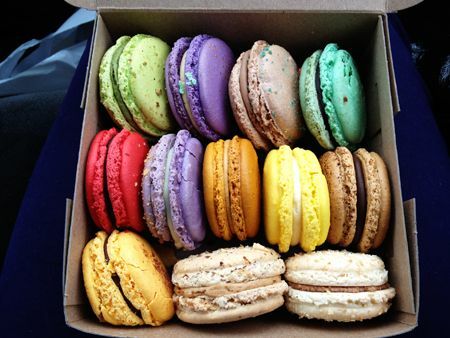 Looks delicious, I love macarons! Great post! 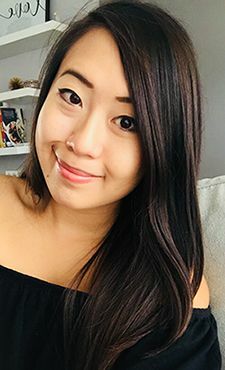 So glad you had a good visit to Jelly Modern and Yann's! Completely agree - I bow down to the Maple Bacon Doughnut at JM and the perfect textures of crispy & chewy of Yann's macarons. I bought a box of macarons last week and another box of brioches and croissants from Yann's. Gone in two days (my poor growing waistline). It's a bad idea to look at these photos at night when I'm thinking of raiding the fridge. Such temptation! Wooow! I'm hungry right know :3 !